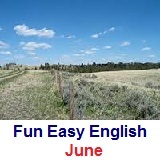 ﻿ Fun Easy English - new classroom free online classes english language lessons speaking listening writing reading june. 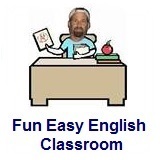 This month in the classroom you will begin learning English consonant pronunciation. Grammar continues with verbs and then on to adverbs. June 2 Slang: letter J What Time Is It? June 4 Words You Should Know: Letter F Can You Say That Again? June 17 Words You Should Know: Letter H How Old Are You? June 19 Reductions: whaddaya What Are You Good At? June 20 Words You Should Know: Letter I What’s Your Favorite Sport?